I saw a pom pom scarf on instagram about a year ago and wanted it immediately. Two problems: it was $100, and the colors in it were…well, less cute than the colors I’d have chosen. 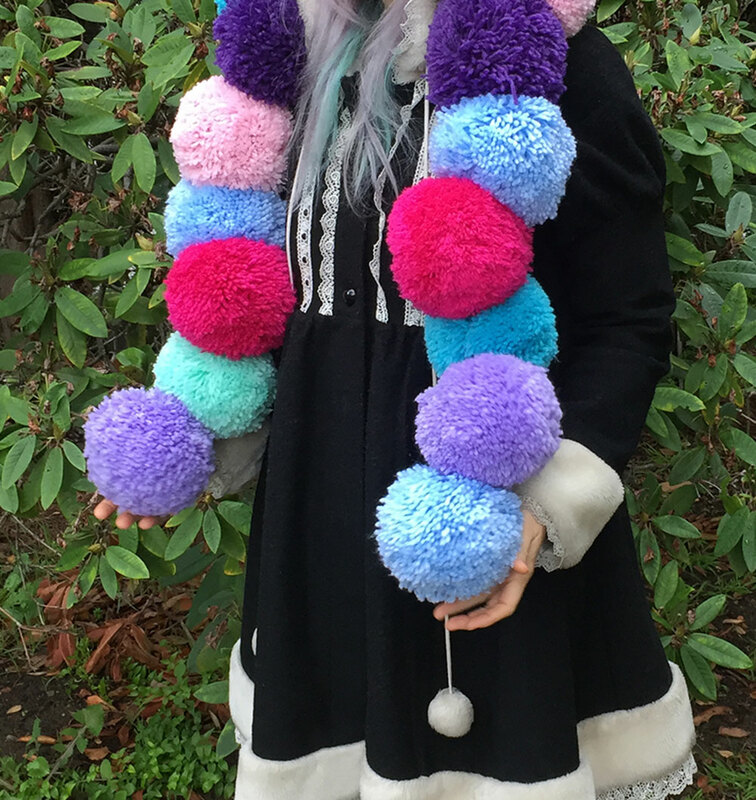 So, I decided to make my own customized vegan dollhouse pom pom scarf. I tried to find tutorials online, but weirdly, the world doesn’t seem to be into grapefruit-sized pom poms. 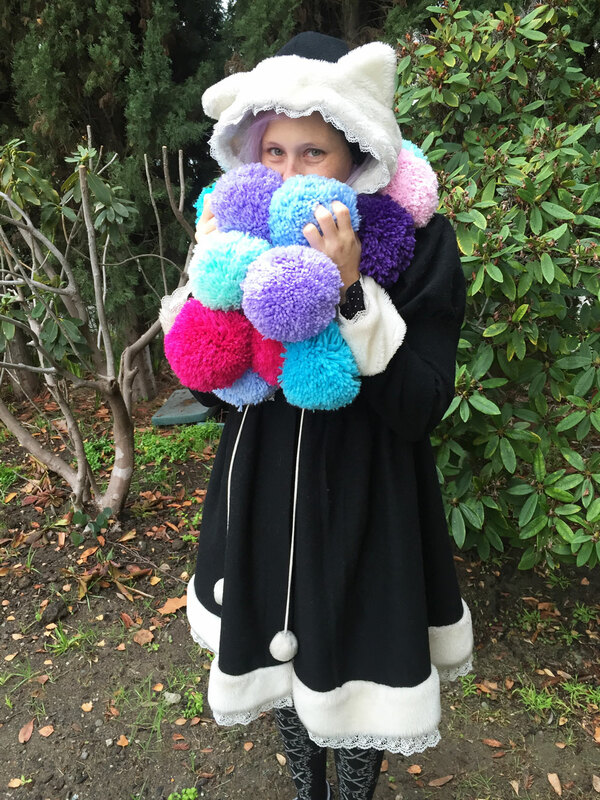 All the DIY pom pom tutorials I found were for way-too-small pom poms. And there are quite a few companies that make tools to assist with pom pom making, but of course, none of them were big enough for my preference. So, I had to figure it out on my own (with a lot of help from Isabelle). 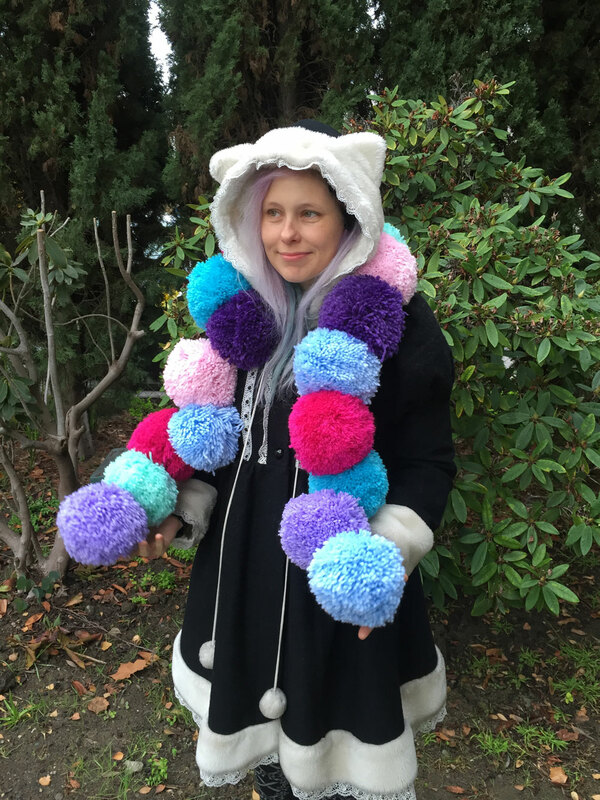 In case there’s anyone else in the world that would want to make themselves a custom kawaii pom pom scarf, I thought I would try to document my process. If you have any questions that I might have accidentally not addressed, please comment or email me, and I’ll do my best to respond to them. The amount of yarn you buy depends on the length of your scarf and the number of colors you want. 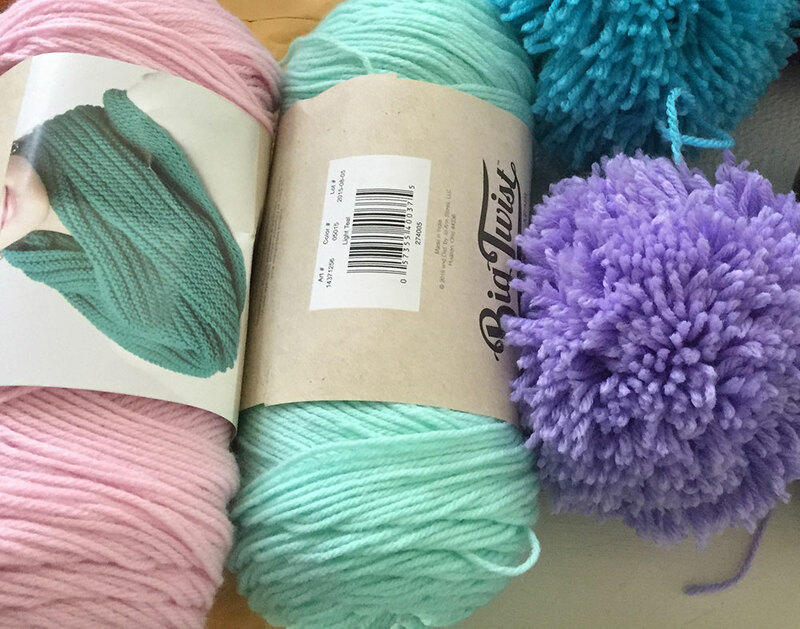 I was able to get 2-3 pom poms from each package of yarn. Purchase yarn that is cotton or polyester (or a blend of the 2) with a number 4 thickness. I bought 7 packs of yarn for my scarf. The number of pom poms you make depends on the length you want your scarf to be. 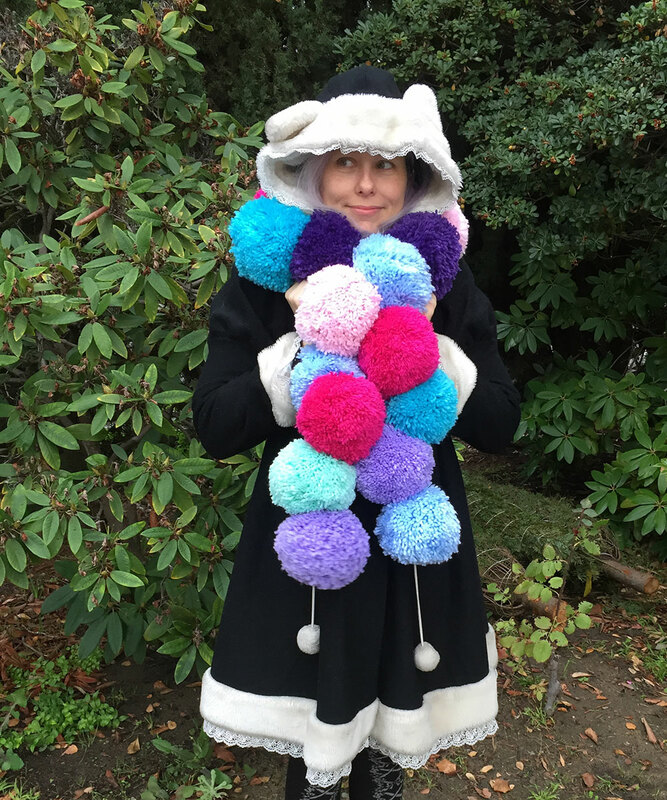 I made 17 pom poms for my scarf. I ended up buying a new pair of scissors for this project because it made the cutting so much faster and easier. Once you cut all the way around the perimeter of the circle, you can use a long piece of yarn to tie it off in the center. Sometimes using a couple pieces to make sure the knot is tight can be a good idea. Here’s a video of me making one of the pom poms. To assemble, I made a long row of all my pom poms and moved them around until I was happy with the color order. Then I used the long strings that were the ones I used to secure the center of the pom poms to tie each pom pom together. Don’t try to tie them together using any other strings because they’ll just pull right out.